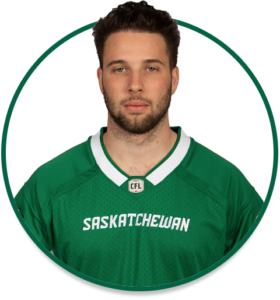 PRO: Acquired by the Riders in October, 2015…signed with the Calgary Stampeders in February, 2015… was selected by the Stampeders in the 5th round (40th overall) of the 2014 CFL Draft. 2018: Missed season after suffering injury in training camp. COLLEGE: Spent five seasons with McMaster…became Canadian Interuniversity Sport’s all-time leader in field goals on October 18, 2014, when he kicked four field goals in a game against Wilfrid Laurier to break the previous record of 82…set a single-season record for Ontario University Athletics…converted on 24 of 27 field goals for the season — an 88.9% success rate — and added 25 extra points for a total of 97 points…was named First Team OUA and CIS All-Star…for his career, kicked 84 field goals, six singles and 140 extra points for a total of 398 points…also amassed 9,489 punting yards.